Old Forest School – Vintage Wedding Venue are proud supporters of the Rotoehu Ecological Trust (RET), here’s a few words about RET from their Chairperson Sarah Orton. You can find out more at the Rotoehu Ecological Trust website. Rotoehu Ecological Trust (RET) first became a concept in 2011, before officially becoming a registered charitable trust in 2013. We operate primarily in Pongakawa Ecological Area (650 ha), which forms part of the wider Rotoehu Forest Conservation Area (some 3,500 ha). In 2015 we added the Otari Block to our management area, bringing the total managed area up to 750 ha. The Trust manages the land in partnership with the Department of Conservation, and in particular looks after a Category One Site (one of only five in the country) of North Island Kōkako (Callaeas wilsoni) population of around 150 birds that is present in the forest. The kōkako are our keystone species and RET works on the theory that if we protect this endangered species then the whole ecosystem will benefit, particularly from pest control. Rotoehu Forest is located some 30 minutes from Rotorua and Tauranga, on Rotoehu Road. In addition to the kōkako population, the forest is also home to whitehead, the New Zealand Bush Falcon, grey warblers, tomtits, geckos, and giant rewarewa, rimu and puriri trees. The Trust protects these native assets by carrying out weed and animal pest control including for possums, rats, mice, mustelids, hedgehogs, wild/feral cats, wallabies, blackberry, pampas and wilding pines. In addition to working with the local Department of Conservation office in Rotorua, RET has also formed valuable relationships with other local and national conservation groups and entities including Kōkako Specialist Group, Kaharoa Kōkako Trust, Otanewainuku Kiwi Trust, Manawahe Kōkako Trust, Kōkako Organic Coffee, Old Forest School, Little Miss Rose Photography, Kaingaroa Timberlands, Ngati Makino, Te Puke Forest and Bird and Western Bay of Plenty District Council. RET first came into contact with Old Forest School around 2013 when we were looking for a venue, close to our patch of bush, to hold a thank you BBQ for our volunteers. It was our first operational year as a Trust and out then chairperson, Murry Clode, recommended Old Forest School as he was friends with the owners, Su-an and Alastair McMahon. The Old Forest School has always been a beautiful and serene place, but back in 2013 Su-an and Alastair had only really begun to cherish it again after years of neglect. For RET though it was, and continues to be, perfect. Over the last four years the relationship between Old Forest School and the Trust has flourished. Su-an and Alastair always love having the Trust, our guests and our volunteers out to use their beautiful facilities (indeed we frequently get told we need to make greater use of the School). In addition to hosting volunteer BBQs, the School has also hosted Kōkako Organic Coffee in their restored on-site accommodation last year when they came down to volunteer with the Trust, and again this year when Kōkako Organic Coffee returned, bringing with them local cafes Artisan and Abracadabra. Su-an, Alastair, and their daughters Holly and Rose are always the perfect hosts, keen to show off their latest additions to the School, whilst making their guests feel warmly welcomed. The whole family take an avid interest in RET’s activities, always wanting the latest news on our kōkako, and working on new and exciting ways to further strengthen our relationship. Old Forest School’s ultimate goal is for the Trust’s activities to be so successful that they have kōkako in their backyard, adding to their dawn chorus. Rose, of Little Miss Rose Photography Ltd fame, also professionally supports RET, acting as the official photographer and videographer. Thanks to her hard work and talent behind the lens, and with the support of her sister Holly, Rose has produced some outstanding photos that capture the very essence of the Trust’s conservation work, and the dedication of our volunteers. The fact that Rose managed to perfectly capture an elusive kōkako on her first outing into the bush is a source of annoyance for Roger, one of our Trustees, who had been trying to do the same, unsuccessfully until this year. Over the last four years of running RET I have come to realise the importance of the support we receive from the groups and volunteers that we engage with. 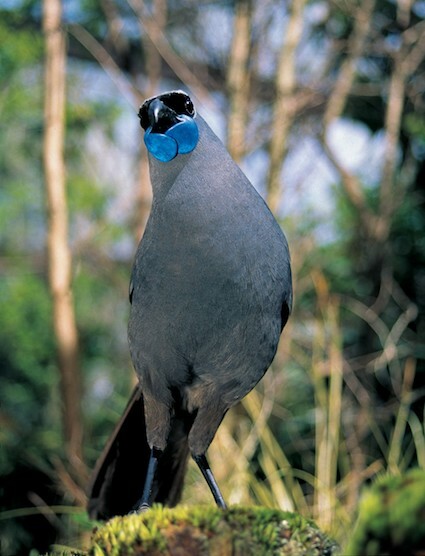 RET’s passion is for our conservation work, restoring and protecting a small part of our natural environment, enriching it for future generations, and ensuring the continued success of the endangered kōkako. But it is the reciprocal passion that we receive from our volunteers, Kōkako Organic Coffee and Old Forest School that truly helps to drive us forward. People like Su-an, Alastair, Rose and Holly take our passion and enhance it a hundred fold. We at RET as so lucky to be able to use the Old Forest School, and count them amongst our supporters, and more importantly, amongst our friends.